Happy New Year! We hope that you had a wonderful holiday season. 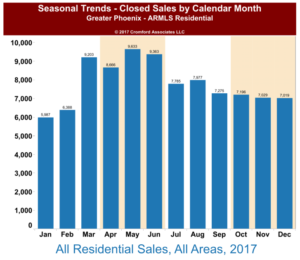 “The reality in Greater Phoenix is that we have shifted from a strong seller’s market with high volumes to a moderate seller’s market with slightly lower volumes. In due course this is likely to adjust appreciation rates from the 8%-10% level to more like 6%-8%. If the CMI** drops below 120 I would change our prediction to 4%-6% but at the moment there is little sign of a fall much below 130. At a CMI of 100 we would expect appreciation. Of course things could change at any point but it would need a new factor coming into play. Mortgage interest rates are at a much higher level than in 2017, though still far below long term averages. The cost of home ownership has risen faster than rents. The tax law changes since 2018 have removed many of the tax benefits of owner-occupied housing relative to renting. We definitely do not have anything approaching a crash or a slump, which would require a large increase in supply. Supply remains weak because many existing homeowners are more reluctant to move. Doing so would require them to give up their existing cheap loan and take out a new more expensive one. They are tending to stay put, which is good news for the likes of Home Depot and home remodeling and redecorating companies. So what is the take-away for sellers and buyers in this market? Despite lessened demand, buyers are still exceeding the chronically low supply leaving most sellers in a gentle seller’s market. The weakened demand is however contributing to more price reductions and a greater likelihood of sellers paying buyer concessions during contract negotiations. For buyers, any plan of waiting for lower interest rates and lower prices will likely result in a very long wait. Even balanced markets typically appreciate at the level of inflation – and it is not likely to be in a balanced market in the first quarter of 2019, perhaps not even in the year. Therefore buyers will still be better served shopping in this gentle seller’s market than waiting for a buyer’s market to arrive. 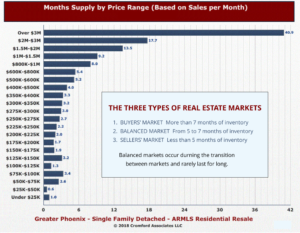 Of course, neighborhoods and price points vary in their supply and demand. For details on your specific area, please contact us. We are always here to help! Thank you for all your support in 2018. Here’s to a wonderful 2019. Probably the hardest thing about routinely writing on the subject of the local real estate market is that it really doesn’t change overnight – thankfully – despite erroneous comparisons to the stock market. Short term trends in real estate are relatively predictable – largely because supply is not highly volatile. By contrast, demand has the potential to be far more volatile – anyone remember Desert Storm? Demand went to zero overnight and then returned in two weeks once it was clear this was really not a war but a “military action”. Despite the dearth of provocative headlines, it is still worthwhile to take a look at the market now that we have reached the half-way mark. Especially since market activity seasonally peaks in May, and gradually declines as we approach the end of the year. 25 is an extremely low reading for days of inventory. 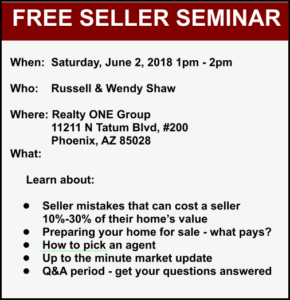 All of the above are in West Phoenix, West Mesa or the El Mirage / Youngtown area, with the exception of 85296, which is rather more expensive”….. Although a year’s supply over the million dollar mark may sound hugely excessive (especially through the lens of the under 500K price range) we well remember years where that price point had 7 years of inventory! So this price point has shifted dramatically. But as mentioned in the zip code study above, not all areas are experiencing the same shortage of supply. Anthem for example, in December was experiencing a lack of supply and seller’s held the power – only to see now, 6 months later, a fully balanced market. As long as demand exceeds supply, prices will continue to rise. This inevitably results in alarmists saying we are in a “bubble” once again. The best answer to fear is facts. 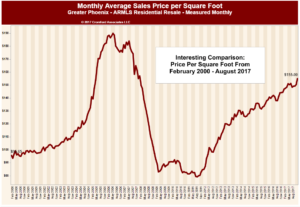 Take a look at the monthly average price per square foot compiled by the Cromford Report. You will note that if you eliminate the wild swings both up and down, we are in a reasonable appreciation range – and the trend line looks nothing like the parabolic curve of the 2005 market. At some point – rising prices (and possibly rising interest rates) will dampen demand, as it is supposed to do. Reduced demand will allow supply to climb and then the market will balance. Does that mean prices will then drop? No, balanced markets tend to see price rises within the range of inflation. The inflation rate for 2017 was 2.1% and 2018 is averaging 2.5% Remember too; price is a trailing indicator – often lagging 3- 6 months behind the market. For those readers who are understandably jittery given the pricing plummet of 2008, take heart. While we do anticipate a balanced market on the horizon – that could be a year or two out and it will take more than a balanced market to see marked price changes. In the meantime, we will watch the trends and keep you informed. Slow moving ships are easy to watch. We hope you all had a wonderful holiday season! Now that we are off to a fresh new year it makes sense to note where the market currently stands. This means buyers are going to have an even tougher time buying than last year in any price range other than luxury. For most sellers, they should enjoy competition from buyers and stronger pricing. ”After peaking on July 28 at 8.6% the appreciation rate for all areas & types went into a declining trend until November 9 when it bottomed out at 3.6%. It then changed course and over the last 5 weeks has risen sharply to reach between 7% and 7.5%…. Such a rapid change in direction is quite unusual. We rarely talk about real estate agents – although they certainly can impact the marketplace in subtle ways. It may be of interest that there was a 6.6% increase in the number of real estate agents since last year as rookies continue to enter the field. While agents certainly don’t set the marketplace (supply and demand does) they certainly can influence the buying and selling experience. Agent skill impacts the counsel clients receive on market behavior or not; negotiate the highest market value or not. They should be the client’s biggest advocate and legally in fact have a fiduciary relationship to the client. As the institutional investment companies are swarming the valley (Offer Pad, Open Door, etc.) sellers can learn the hard way the impact that a missing real estate advocate has in terms of reduced proceeds. Particularly disturbing is the institutional buyers’ offers of “no commission sale” while charging fees in excess of 9% – far beyond what might be charged as a commission. Add in the typically lower than market value and imaginary “repair costs” and sellers are paying dearly for that lack of representation. Lower than true market value sales can impact appraisals and subsequent neighboring sales – a sobering thought for all of us vested in defending neighborhood values. As 2018 continues to progress we will endeavor to keep you apprised of the emerging trends. Of course every home sale has its own concerns, so please don’t hesitate to contact us for a customized analysis of your neighborhood. Here’s to a wonderful 2018! Is it just us, or has 2017 seemed to fly by? As 2017 heads to a close, inevitably we reflect and compare this year to the previous year. Although the final tallies are not in, we still can draw some solid comparisons. Most homeowners and would-be homeowners (buyers) find pricing statistics the most interesting of all statistics, understandably. Yet it is wise to remember that pricing is a trailing indicator – not a leading one. Pricing trends take time to show up and become meaningful. Further there is a seasonal factor that can obfuscate the market trends. For instance, in a “typical” year pricing rises during the spring buying season and tends to peak in June. Then the second half of the year goes flat on pricing (and can even have a small retreat). Pundits who don’t know or care to factor in the seasonal component of the market can write alarming headlines about the market when fall arrives – only to see it miraculously “recover” again in the spring. Annual prices tell the actual story of what occurred. Price trends remain weakest for the high end of the market and despite much stronger sales numbers than last year, the top end remains over-supplied. 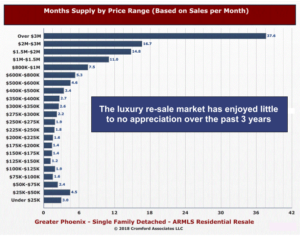 This is not unique to Central Arizona as we see similar weakness in luxury pricing across most of the USA. The low-end and mid-range still have price momentum and given the deterioration in supply, especially in the Southeast Valley, we expect that to continue for some time. Interestingly, condos & townhomes are enjoying a faster appreciation rate than single family homes at the moment. This is largely due to the price point and the demand they are able to answer that single family homes simply cannot fill. Because supply/demand ratios ultimately tell the story of the market and are a leading indicator, let’s turn our focus there. So far in 2017 we are up only 1.15% for new listings over this time in 2016. Overall, the supply remains chronically weak and there is little sign of any improvement… Here we can see the huge reduction in supply that has occurred over the past 4 years. The seasonal pattern clearly shows up, but each year is much lower than the year before. It is starting to look as though there will not be much of a market below $200,000 before too long. …and demand has been slightly weakening for several months now and at first sight it looks slightly weaker again at the start of October, although when supply is poor, it can be very hard to detect weakening demand out there in the market because there is enough demand to soak up all the supply and then some. We hope this gives you an accurate picture of the market so you can ignore any headlines to the contrary. As the holidays approach, we want to take a moment to thank all our clients and friends whom we are so fortunate to work with. We are truly humbled by the trust you place in us and we are committed to always doing our best to protect your interests. Thank you and Happy Holidays! Struggling to Recognize a Normal Market? For those who prefer an article in a Twitter-like format â€“ supply is still constrained, demand appears to be slowing (is this seasonal or an actual decrease?) and we are in the midst of a very â€œnormalâ€ market. For those who prefer details, continue on. The problem with a â€œnormalâ€ market is that the Valley went through such an extended period that was NOT normal (2004-2011). Long periods of abnormality can start to feel like the new normal â€“ so when normal actually shows up it is apparently unrecognizable as such. Homeowners are understandably confused when reading inflammatory housing headlines meant to snag readers. Headlines such as â€œThe Valley is in a Normal Real Estate Marketâ€ is a snooze fest so donâ€™t be startled when various news sources claim otherwise. To site a few recent examples, Ed Delgado, President and CEO of Five Star announced at a conference for â€œforeclosure specialistsâ€ that foreclosures are going to go up in a number of cities, one of which was Phoenix. 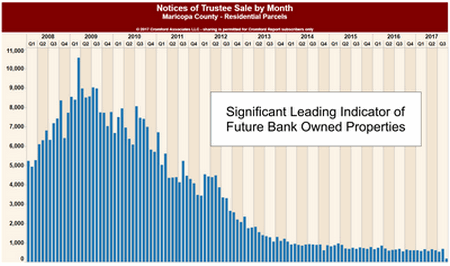 Much to the contrary, delinquencies in the valley are lower than any time since 2002, to have foreclosures you must first have delinquencies. Forbes also recently published a headline â€œ58% of Homeowners think the housing market is set for a correction â€“are Bubble Fears Founded?â€ To answer the question â€“ no – bubble fears in the valley are not founded. 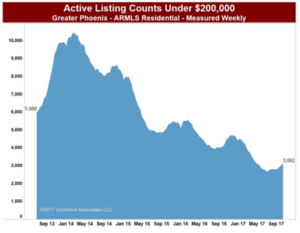 Housing Wire similarly states that Phoenix is one of the states â€œoverheatedâ€ and â€œoverpriced by double digitsâ€. Hmmm â€“ interesting theory but again not factual. Supply remains lower than last year, but the gap closed slightly compared with last month in terms of active listings with no contract. 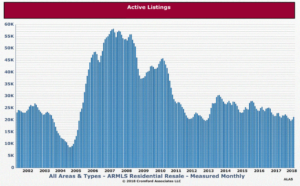 We are starting to see more new listings than last year. The third quarter is up 2.5% from last year and up 5.5% from 2015. So far the extra supply is not having much effect, but if it continues for several months finding a property could start to get a little easier for buyers. We still have a seller’s market in most locations and price ranges, but the current trends means the seller’s advantage has very little momentum. Before buyer`s get too excited, the trends are very mild in nature. As such we do not currently see major increases in buyer’s bargaining power coming anytime soon. â€¦Many people assume when prices have returned to 2006 peak levels then the market has recovered. However understandable, especially for those who purchased during that time frame, thatâ€™s not necessarily the case. 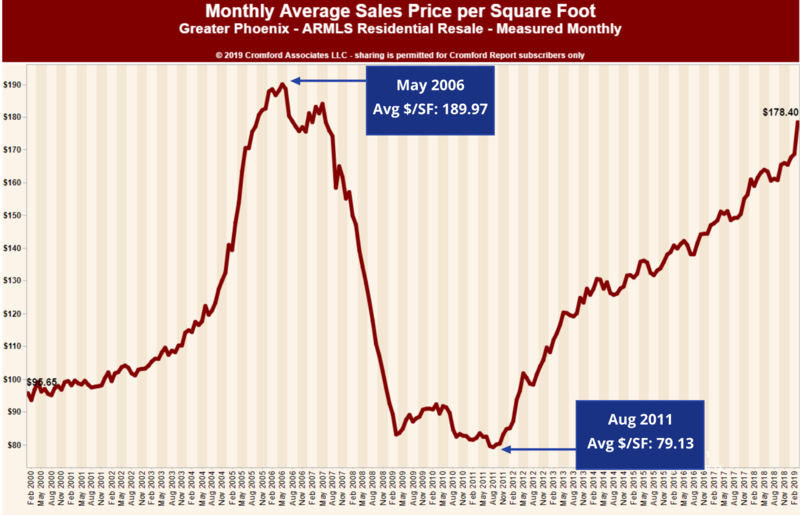 Average sale prices per square foot are still 27% away from the peak of 2006. However, the market could arguably be considered recovered once prices reach the range that corresponds to the long term average rate of inflation, which from 2000-2016 in the United States is 2%. In 2000, the average sales price per square foot for MLS resales was $96. 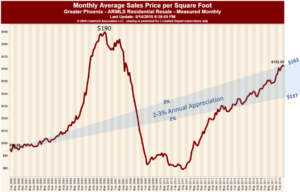 Had the bubble and crash never happened, and annual appreciation stayed between 2-3% per year as normal, then prices would land between $134-$158 per square foot today. Currently theyâ€™re running at $149, which equates to averaging nearly 2.6% annually and a 55% total gain since the year 2000. So normal and recovered seem to be hand in hand in the valley. That should be good news for jittery homeowners reading way too many headlines. As always, we are here to help you understand your home in todayâ€™s marketplace. We appreciate and welcome your questions and comments.